In this riveting new novel, bestselling author John Darnton transports us to Victorian England and around the world to reveal the secrets of a legendary nineteenth-century figure. 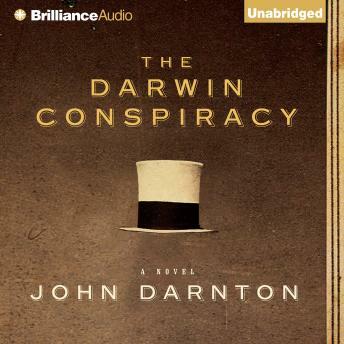 Darnton elegantly blends the power of fact and the insights of fiction to explore the many mysteries attached to the life and work of Charles Darwin. What led Darwin to the theory of evolution? Why did he wait twenty-two years to write On the Origin of Species? Why was he incapacitated by mysterious illnesses and frightened of travel? Who was his secret rival? These are some of the questions driving Darnton's richly dramatic narrative, which unfolds through three vivid points of view: Darwin's own as he sails around the world aboard the Beagle; his daughter Lizzie's as she strives to understand the guilt and fear that struck her father at the height of his fame; and that of present-day anthropologist Hugh Kellem and Darwin scholar Beth Dulcimer, whose obsession with Darwin (and with each other) drives them beyond the accepted boundaries of scholarly research. What Hugh and Beth discover - Lizzie's diaries and letters lead them to a hidden chapter of Darwin's autobiography - is a maze of bitter rivalries, petty deceptions, and jealously guarded secrets, at the heart of which lies the birth of the theory of evolution.